New Tennis Psychology Program will significantly raise your NTRP rating in one week, and it's totally Free. You will experience dramatic tennis improvement with my psychological, inner tennis and mental training techniques. 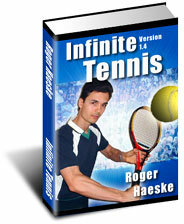 This tennis instruction program can improve your game by simply changing your thinking. Most players are playing well below their potential. Your limits are based mostly on your false beliefs, than on your true ability. I've been teaching for over 15 years and I've found that most of my students had a low self-image of their own ability. Players are loaded with false beliefs about their athletic potential as well as what possible via mechanics. By simply visualizing yourself as a professional player your game will improve. Always focus on what you want to happen and not on what you don't want to happen. This is an important psychological technique. If you consistently do this you won't choke as often and you'll find yourself playing in the zone more often. I've raised the level of my game without any additional practice time. I simply changed my beliefs and how I was thinking during a match. Now I've learned how to use Visualization properly while playing. Hundreds of my students have improved their games with these techniques as well. This Revolutionary Program will also help you learn much faster than most traditional teaching methods . I've found ways of thinking and learning that are very natural and easy to do. In fact you learn quicker by using learning techniques from the Player's Perspective. So come on in and get ready to play the best tennis of your life and take the club championship trophy home.